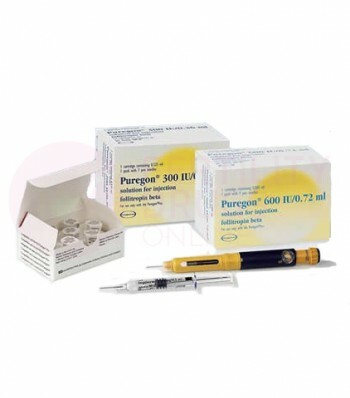 Puregon, with the generic name follitropin beta, is a follicle-stimulating hormone (FSH). This gonadotropin hormone comes in the form of a powder or pre-mixed solution for injection. Although follicle-stimulating hormone occurs naturally in the human body, the FSH in Puregon is made using recombinant DNA technology, in which cells in a laboratory produce human FSH. Doctors will often use this injectable medication for fertility treatments or in vitro fertilization (IVF) treatments. Doctors normally prescribe Puregon pen to treat female infertility. This may be for assisted reproductive techniques like IVF treatments, helping to simulate the ovaries to produce multiple eggs for harvest. Doctors may also prescribe the drug to treat anovulation, which is when the ovaries do not produce eggs, if the patient does not respond to other common fertility drugs like Clomid. The medication can also treat male infertility when the man has hypogonadotrophic hypogonadism, which is a hormone deficiency. In this case, this medicaine helps to stimulate sperm production much like it helps to stimulate egg production in women. The follicle-stimulating hormone (FSH) in Puregon is one of the hormones that regulate reproductive functions in the human body. Normally, FSH helps stimulate the production of eggs in women and the production of sperm in men, but sometimes FSH levels are low. The drug injections increase the amount of FSH in the body, helping follicles grow and mature. These follicles can then release an egg, to potentially be fertilized. Your fertility doctor will give you directions on how and when to give yourself Puregon injections, and you can also refer to your product leaflet. After mixing Puregon if it is not already in solution, you should inject the solution subcutaneously, which is beneath the skin, or into a muscle. For subcutaneous injections, you can inject a pen into the navel or upper thigh, and for intramuscular injections, you can inject this fertility drug into the upper buttocks. To reduce irritation, inject the drug into a slightly different location each time. Your doctor will tell you the dose of Puregon you should inject and when, but a common dose is 50 IU with injections lasting from seven to fourteen days, although your doctor may make adjustments based on your body's response. Your doctor may use an ultrasound or blood test to determine how your body is responding to the Puregon. For IVF treatments, your fertility doctor may prescribe 150 IU to 225 IU a day for four days, then after adjustments to the dose, injections for another six to twelve days. When doctors use this medication to treat male infertility, they may prescribe 150 IU three times a week or 225 IU twice a week, with injections lasting three or four months. When your Puregon injections are complete, you may start injecting human chorionic gonadotropin (hCG) to induce ovulation. You should not use Puregon pen if you are allergic to the follitropin beta it contains. Do not inject the drug if you have ovarian, womb, breast, testicle, pituitary gland, or hypothalamus tumors, or if you are a man with testicular failure. Women should not use this medication if they have primary ovarian failure, ovarian enlargement, cysts that are not from PCOS, or vaginal bleeding. You should not use Puregon if you are pregnant or breastfeeding. The drug may increase the risk of blood clots, ectopic pregnancy where the baby develops in a fallopian tube, and multiple births such as twins. Do not double dose the injection, but instead contact your doctor if you have missed a dose. Always properly dispose of all needles and medical supplies, and keep the drug out of the reach of children. You can keep cartridges you have punctured with a needle in the refrigerator for up to 28 days. If unopened, you can store the medication up to three months at room temperature. Your fertility doctor may prescribe Puregon in conjunction with your IVF treatments or on its own to help boost your fertility. The follicle-stimulating hormone in Puregon helps the follicle to mature, so your doctor may prescribe a human chorionic gonadotropin (hCG) drug to induce ovulation after your FSH injections are complete. You may also use an ovulation test to help determine when you are ovulating, and the best time to conceive. Polycystic ovary syndrome, also called polycystic ovarian syndrome, is a common cause of anovulation, which is lack of ovulation. PCOS is an endocrine disorder that can cause infertility. Other symptoms of PCOS include infrequent or prolonged menstrual periods, acne, excess hair growth or male-pattern baldness (alopecia), and obesity. The hallmark symptom of PCOS is enlarged ovaries containing follicles, which are fluid-filled sacs, and doctors confirm this symptom using an ultrasound exam. Doctors may also test for the presence of high levels of male hormones, called androgens, which cause many of the PCOS symptoms. Although doctors do not know exactly what causes PCOS, it seems to be related to insulin resistance and inflammation. Doctors often treat PCOS, and its associated infertility, using drugs which adjust the amount of insulin or other hormones in the body, to stimulate ovulation. In vitro fertilization (IVF) treatments are expensive enough without the added cost of IVF drugs like Puregon. Even without IVF, the quest to conceive can be a financial burden for many couples. We are a licensed Canadian pharmacy and help women order affordable Puregon. Before buying it, you should first speak to your fertility doctor about which fertility drug is best for you. Once you have a prescription, return to us and place your order by phone or online. We will pass your prescription and medical information on to one of our partner pharmacies, who will then ship your order so you can start boosting your ovulation for a successful pregnancy.